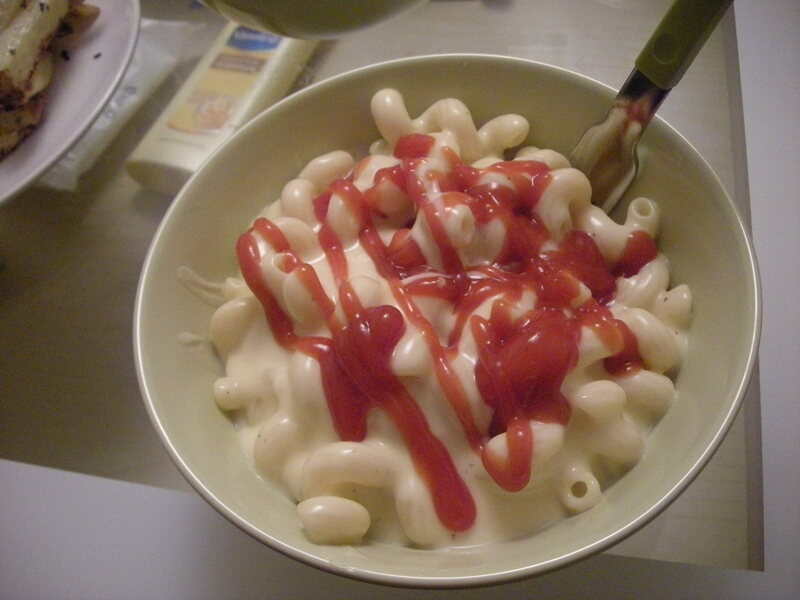 I love ketchup on my macaroni and cheese. Who doesn’t!? This recipe for macaroni and cheese is unlike any other I’ve ever tried. It is delicious, and it just the right amount of cheesy. We found this delicious aged Welsh cheddar on sale at Marks & Spencer, but unfortunately it was only a promotional product, so we’ve had to go back to regular cheddar. If you can use an aged cheese, you will not be disappointed. But have no fear, it is still absolutely delectable with regular cheddar. Cook and drain your macaroni as per package directions, then set aside. In a large saucepan, melt your butter. In a separate bowl, combine the salt and pepper with the flour. Slowly add dry mixture into butter and whisk constantly (making a rue) until blended. Pour milk in gradually, stirring constantly. Stir until well incorporated. Bring to a boil and let boil for 2 minutes, stirring constantly. Reduce heat and cook for an additional 10 minutes. The sauce should thicken, but you need to keep stirring! Switch hands if you want to avoid the Popeye look. Add shredded cheese little by little and simmer until the cheese melts. Pour sauce over macaroni and stir together until coated. Optional: Bake your macaroni and cheese in a 400°F oven, for about 20 to 30 minutes to crispen up the top layer of cheese. You can also grate additional cheese on top to make a crust of cheesy goodness. Source: We found this recipe on Food.com a few weeks ago and have never looked back. I opt not to bake it, as I am usually too impatient. This entry was posted in Recipes and tagged childhood favourite, macaroni and cheese, recipe. Bookmark the permalink.